gatherums: The Past Two Months! So I thought time went by fast before, but now that I have a child it goes by even faster. So we have had a crazy, crazy past two months and I hate that I haven't had the time to update. We blessed Tavin on August 22nd at home with family and close friends. Tyler did an amazing job, as always! Then at the end of August we went with my family to California. We go every other year and it was so fun. 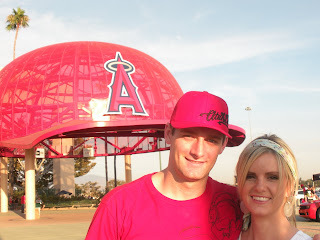 We of course went to Disneyland, the beach and this year we decided to go to an Angels game as well. Tavin was magnificent on the plane! We also took him on his first rides at Disneyland. The first one was Peter Pan, but he was asleep. Then we took him on a Small World and he absolutely loved it. He was wided eyed the whole time and smiling. I love that ride cause of all the different cultures you see and how great would it be to be a child and have no judgement, but joy to see all the diversity! Ty has been soooooo busy with school and work. We take advantage of every minute we get with one another since we don't get that many. I have been busy being a mom and working when I'm not doing that. I feel like I keep going and going and going! Tavin just had his 4 month checkup and is doing wonderful! He is now 27 inches long which is off the charts, and 15 1/2 pounds! Tavin spoils us so much! He is seriously the best son we could ask for. He is now talking, laughing, smiling, drooling, razzing (aka spitting), holding his own bottle and trying to sit up all on his own. We are excited for Tavin's first halloween. We are still trying to decide on what he will be, but we will have pictures and I promise that is won't be two months later. I'm excited to check out all your post and see what you all have been up to. You are the cutest family ever!!! So cute!! Thanks for the update! Glad to hear ya'll are well! Miss ya'll! He is a little chunk of cuteness, Al. You guys look great and like you are having fun! Miss ya! UMMM its about time we see some updating! 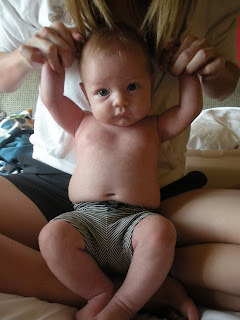 Love that little gut! Cute pictures! He is getting so big. Ali he is so cute! I can't believe its already been 4 months! I miss having you guys around! Yep, I hear ya. Time flies like crazy. Tavin is yummy enough to eat!!! Fun pictures!